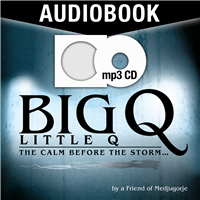 3 CD Set: The calm before the storm? Find out all about it in this edge of the seat read. 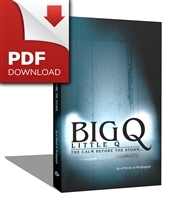 Download: An edge of the seat read reveals all about "Q"
MP3 CD: An edge of the seat read reveals all about "Q", "Qanon", and Big "Q"
MP3 Download: An edge of the seat read reveals all about "Q", "Qanon", and Big "Q"
The founding of this nation, in a most remarkable way, can be traced to the spiritual. The calm before the storm? Find out all about it in this edge of the seat read. The national bestseller They Fired the First Shot 2012 in a case of 16 books! 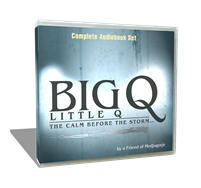 The new bestseller, Big Q, Little Q: The Calm Before the Storm, in a case of 56 books! We have all brought about the sins of our nation through our own unholiness. We must ask the question, has the present system of electing and governing betrayed the Declaration of Independence and the Constitution? Prayed in the Pentagon, convents, and every major patriotic event. A must-have for the Fourth of July, Veteran's Day, Memorial Day, and any other patriotic days. When communism fell in the Soviet Union, the communist mentality in its members did not fall. They continued in their positions, with all the corruption and ways they had used for decades.